The Donut Directory: The Donut Dip 54 years, 3 generations and delicious donuts!! The Donut Dip 54 years, 3 generations and delicious donuts!! Angela Carbone, of The Republican, said it best when writing of the 50 year history of the Dip in 2008. "They could shoot "Happy Days" here, and about the only things they'd need to change are the price of the doughnuts and the latte machine." It's good to know some things never change. 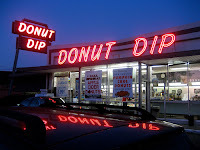 Located at 1305 Riverdale St, West Springfield, MA, the Donut Dip was opened in 1957 by Charles Sheridan after losing his job as a GM Hathaway Bakers due to a general strike. Needing to provide for his growing family Charles hired one of the Hathaway bakers and more than half a century later the Donut Dip is on the 3rd generation and still turning out some of the best donuts in New England. I have visited the Donut Dip several times in the past and, as I regularly map out trips in reference to donut shops, last Friday I was fortunate enough to have a reason to go back. Having met the new owner of a classic motorcycle I was delivering in the parking lot, I headed inside for a coffee and donut. I was fortunate enough to be greeted by the wide smiles of Kathleen and Kate, who were diligently stocking the racks for the Friday night rush. Having a 10+ year history with the Donut Dip, Kathleen was only too happy to swap donut stories and introduce me to the baker, Rich, who was busy glazing fresh cherry cake glazed..yum. Rich, also a 10+ year veteran of the Donut Dip, is surprisingly the freshman baker of the crew. He gave me a breif tour of the kitchen, showing the Dutchess cutter which can cut 30+ yeast donuts at a time, the proofing cabinets, fry tanks and cooling racks. "We still do it all by hand! ", exclaimed Kathleen as I looked around wide-eyed. As if I needed additional proof, she handed me one of the fresh sour cream cake donuts, which the Dip is famous for, "See if you've every had anything like this"...delicious; light and moist inside, crisp outside with now grease- perfect! 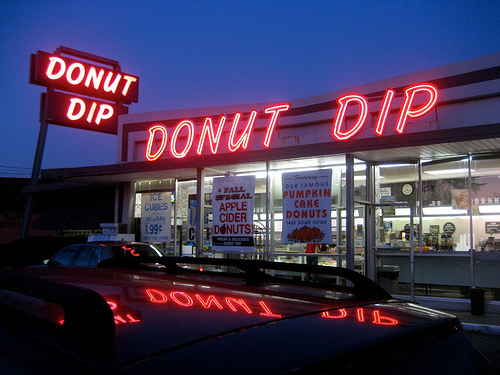 If you're in West Springfield, make a few minutes and find the Donut Dip, where past meets present and taste is everything. I'll see you next spring for some Hot Crossed!